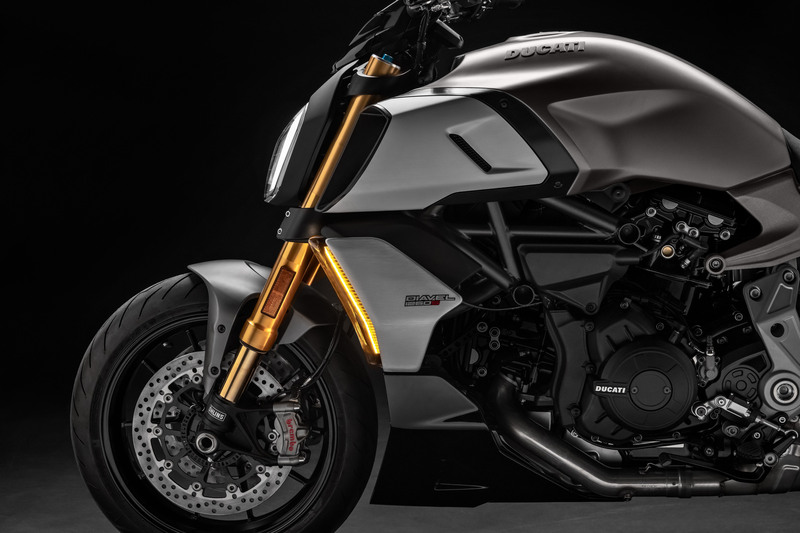 The Ducati Diavel receives its first major update, receiving the same Testastretta DVT 1262cc engine as the XDiavel among other changes. Ducati made a few changes to the engine, the most obvious one is modifying it for a chain drive instead of the XDiavel’s belt drive. The 2019 Ducati Diavel Diavel 1260 now claims 159 hp at 9500 rpm and 95 lb-ft. at 7500 rpm from the variable cam timing V-Twin. The valve timing system adjusts power delivery to suit the conditions, promising smooth delivery at low revs and sportier performance at higher revs. Ducati also revised the engine mapping for sportier performance than with the XDiavel. The electronics are managed by Bosch’s six-axis inertial measurement unit (IMU), which constantly adjusts for roll and pitch angles and the speed of altitude changes. The Diavel 1260’s ride-by-wire system offers three modes: Sport, Touring and Urban, each with its own engine mapping plus settings for traction control, wheelie control and cornering ABS. 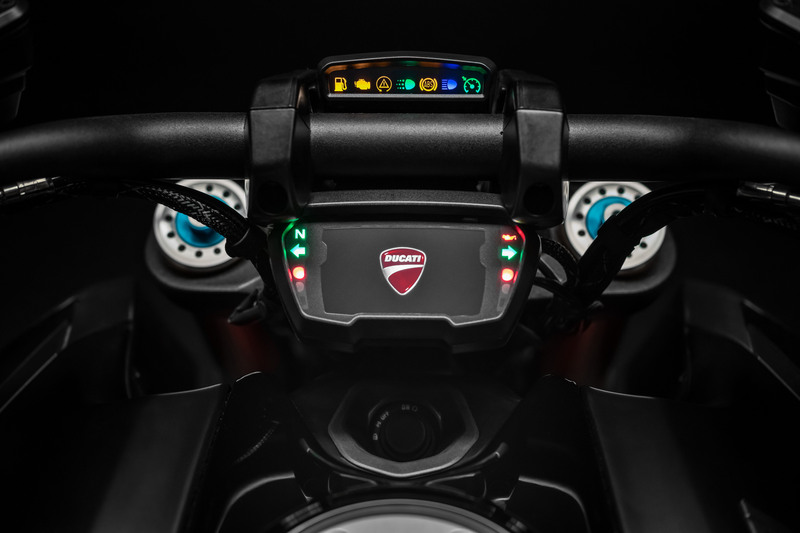 The Ducati traction control system offers eight levels. Levels 1 and 2 offer more wheelspin for sportier intents; levels 3 through 6 are for dry road conditions and levels 7 and 8 are programmed for maximizing grip on wet surfaces. The wheelie control system also has eight levels, adjusting power and torque for a balance of performance and safety under acceleration. The Bosch 9.1MP cornering ABS interacts with the other electronics settings plus data from the six-axis IMU to optimize braking for both the front and rear wheel, even when leaned over. At level 1, ABS is only applied to the front wheel to allow the rear wheel to drift. At level 2, ABS is applied to both wheels with the cornering function programmed for sporty performance. At level 3, the system enables rear wheel lift detection while the cornering function errs on the side of safety. The Diavel 1260 uses a steel trellis frame similar to the one used on the XDiavel. The frame uses the engine as a stressed element of the chassis, attaching to both cylinder heads. The cast aluminum rear subframe attaches to the rear cylinder head while two forged aluminum side plates attach to the base of the engine and connect to the single-sided swingarm. 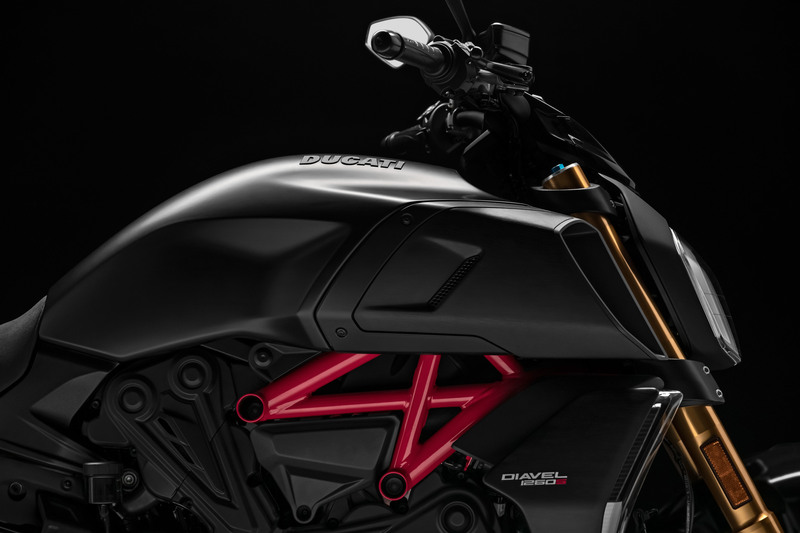 The 2019 Diavel 1260 uses 50mm forks, with damping compression and spring preload adjustable on the left fork tube while the rebound is adjustable via the right tube. The rear wheel is suspended by a spring preload and damping rebound adjustable monoshock. Ducati also a more up-spec Diavel 1260 S which employs a fully adjustable 48mm fork and rear shock form Öhlins. 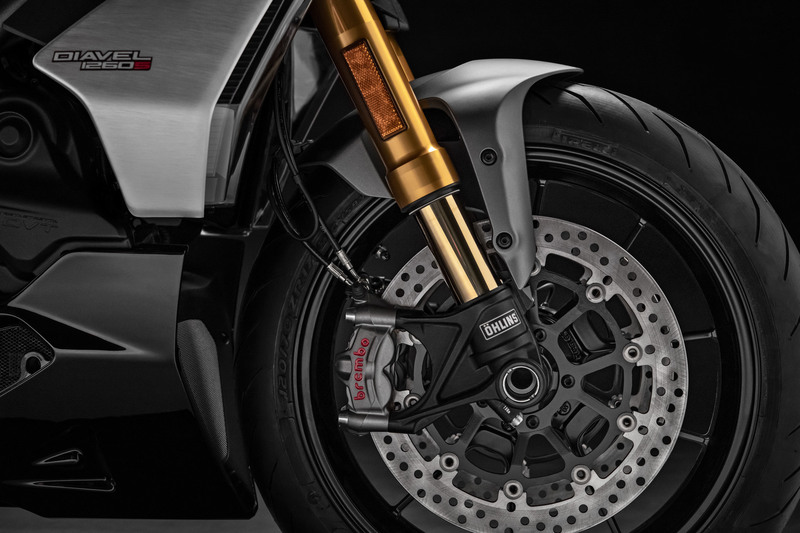 The S model also uses Brembo’s M50 monobloc front brake calipers with a PR16/19 radial brake pump, whereas the regular Diavel 1260 uses Brembo’s M4.32 calipers and PR18/19 radial pump. Both versions run with dual 320mm front rotors and a 265mm rear disc with two-piston Brembo caliper. The base Diavel uses 14-spoke wheels while the Diavel S uses 10-spoke wheels with a machined finish. Pirelli supplies the Diablo Rosso III tires, with a 120/70 ZR17 tire up front and a wide 240/45 ZR17 at the back. Other features include a TFT display, hands-free ignition, backlit switchgear and cruise control. The S model adds bluetooth connectivity and full LED lighting including daytime running lights in markets where they are allowed.